❶ Send birthday flowers online with the help of the service from KROKUS studio. Send birthday flowers online with the help of the service from KROKUS studio. How can one congratulate dearest and relatives, being hundreds of kilometers away? Very easily! To send birthday flowers online, the best floristic studio of Riga and Latvia KROKUS offers to its clients. You can order a birthday bouquet flowers on the website in just 5-10 minutes. In addition, you can apply by simply calling the operator of our online shop by +371 200 303 06. Organize a pleasant surprise to friends or acquaintances by sending them a beautiful birthday flowers in Riga and any city in Latvia. How to send birthday flowers online in Riga? We have been accustomed to order any goods and services using the Internet. Today with the help of a smartphone or a computer, you can buy appliances, clothes, shoes, food and other goods without leaving your home. Why not use modern technological progress and not order to send birthday flowers online to Riga or any other city in Latvia? Moreover, one of the best online shops - KROKUS is ready to take on all work on making a chic bouquet and its delivery. To send birthday flowers to Riga with best wishes! ● elegant bouquets of hyacinths, irises, germines, lilies, freesias, hydrangeas, peonies and other garden flowers. A special attention also deserves designer's arrangements from professional florists, made in the form of a festive cake. Such a bouquet can be supplemented with chocolates, fruits, berries or real candles. In addition, when ordering a bouquet online in KROKUS with delivery in Riga, you can choose the size of the next online flowers in accordance with the planned budget. Thus, even the most expensive and premium bouquet can become quite accessible. 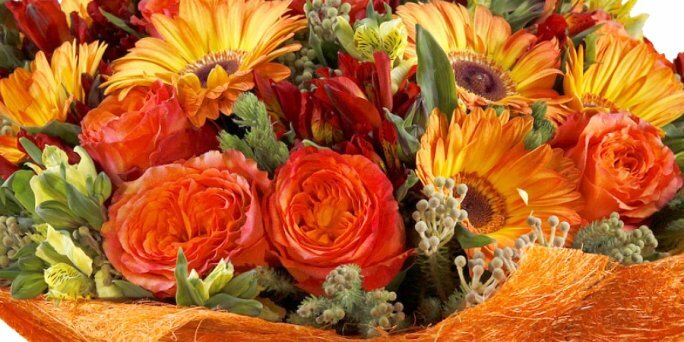 The best flowers online in Riga from professional florists. How to order online delivery flowers in Riga (Latvia)? Send flowers today online to any address in Riga and all over Latvia in order to congratulate a birthday or anniversary person. This is very simple, just use the convenient form of ordering a bouquet on our website or call the manager of the company KROKUS at the specified phone number. Congratulate a birthday or anniversary person and send birthday flowers online to the address in Riga and any other city of Latvia with the help of the best online shop KROKUS.